I told them I have a depression..
You're telling me to take medicines, go for a walk, run, or work out? You're telling me not to be alone, and write diaries? Sighs.. It's the same thing with you telling me to die. How will those things help me? I'm trying so hard, but it just doesn't work out.. That's why it's called 'depression'! And on top of that.. I even think about things like this..
-Then what do you expect us to react? 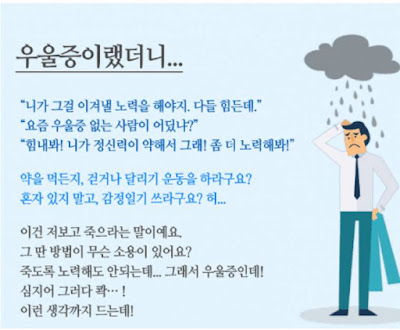 Say 'Oh, I got it~' when you tell us you're suffering from depression? -When someone is revealed to be suffering from depression, people usually react like 'Ah.. Really..?' and they suddenly don't want to get closer with that person anymore..
-The real answer is to go to the hospital to get some treatments for it..
-What are we supposed to do then? Ignore you..? -I've went through this.. It would've been better if they just react like 'Ah.. I see..', pat on my shoulders, or hold my hands.. It would've made me feel better that way.. After confessing to my friend that I'm depressed and seeing her reaction, I suddenly felt like there's no use to tell her further things about it because she wouldn't care.. And, I just ended up making a huge wall between us..
-It hurts.. Especially hearing those things from people that you trust the most..
-Aren't you supposed to take medicines? And isn't working out supposed to be really good for people who have depression? -People with depression will have a hard time to accept your words no matter how careful you are before you say it.. Because depression is not something that can be cured with comforting words..
-Is it our fault that we're not suffering from depression? Why is this so hard.. I don't know what are we supposed to react..
-That's why I've never told anyone about my depression..ㅎㅎ Seeing from the comments, seems like people like me are such a burden to the society.. I think I should just shut my mouth from now on..
-I've heard that from my siblings.. That hurts so much, it's the biggest scar I have in my heart.. I mean, it took me a lot of courage to confess it.. So that's why I don't even talk about it now..
-I don't mean to be mean or anything but, how are we supposed to react then?